Day 184 – I bet the Avon lady never has to put up with this. So I was having a big bad case of writer’s block earlier. And as I do, I turned to plurk for help. Tymmerie suggested I dress up like the Avon lady and go door to door around my Linden home neighborhood. Sounded like a good plan to me! However, there were 2 things wrong. 1 – I have no idea how Avon ladies dress. The ones I know around here all work from home and I didn’t think sweats and a t-shirt would make many sales. And 2 – I didn’t have any makeup or catalogs. Not to be deterred, I put on a cute dress and found a bento box. I could go door to door offering lunch!! What a great way to make friends! Just as I was getting ready to head out, out of nowhere some guy landed right outside of my door. Heck, this was going to be easier than I thought! Everyone loves bento boxes! See how they just flock to my door?? I stepped outside to say hi. [14:40] Alicia Chenaux: Hi. Would you like some lunch? [14:40] Random Guy: what do you have? [14:41] Alicia Chenaux: I have rice bunnies. [14:43] Alicia Chenaux: Nope! I was just getting ready to walk around and see if anyone wanted some lunch. Fun! I’m offering lunch and making friends! This couldn’t be easier! [14:48] Random Pervert: if your dress in sl was real…how would it open? It was then that I ran back to Bluebonnet. After that, I decided to walk around the island and see if anyone wanted some lunch. After all, who better to offer lunch to than my friends, right? At least they won’t ask me how my dress opens. Emerald wasn’t home, so I had to ask her dinosaur if he wanted some lunch. I went over to Stacie‘s house, but alas, she wasn’t home either. Her llama was, though. I stopped over at Ford‘s place, but he wasn’t home either! By that time, I figured my free lunch giveaway was a bust. Also? People on my island REALLY love animals. Day 103 – Baby, we done moved on in! So the big news today? The Linden homes registration is open! If you’re a premium account holder and you have 512m of tier free [all premium members have it if they have not purchased mainland], you can sign up! I actually had purchased a 512 a few months ago just to have it. So today I decided to get rid of it. I’m not hurting for money right now and had paid next to nothing for it, so I slapped a price of $500L on it and put it up for sale. Within SECONDS I was surrounded by landbots. But with my 512m now free, I went to check out some of the areas where I could have my Linden home. Elderglen is very whimsical, with fairies and big mushrooms and all of that. It’s cute, but definitely not what I had in mind. The Japanese themed area of Shareta Osumai is very very pretty, but I knew right away it was not for me. The Tahoe area was very foresty and nice, but again, just NOT what I wanted. And I also didn’t get a photo. What did I want? 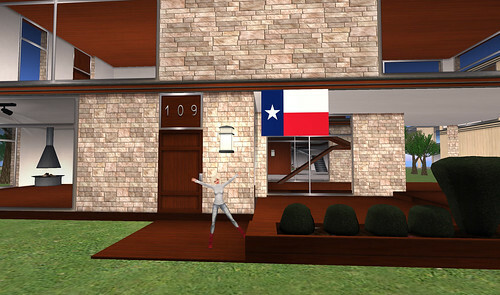 Well… I have my tasteful pretty home on Bluebonnet. I wanted a home where it could just be crazy. And so? The Meadowbrook area is where I knew I could really let loose. Or as loose as 117 prims would allow me. Hell yeah. Texas is in the house. You do get to choose what style of house you want, but you do not get to choose your location, other than which region you’d like. I ended up on the Flageolet sim. By chance, my friend Rob is just a little ways down from me. We’ve already been shouting to each other…which is actually frowned upon. Oops. I’m sure I’ll have a blast decorating in a way I’d never do normally. I’ve even met the next door neighbor, and he didn’t seem to have issues with my pool duck. I love having a new little place to play in!